One of the most-anticipated movies of 2009 is J.J. Abrams’ new Star Trek movie. It’s a prequel of sorts that will recast the characters made famous in the original 1960s series. Longtime fans have been looking forward to the return of Leonard Nimoy as an aged Mr. Spock. It’s now been announced that another original castmember will be returning as well. Of course, you’ll never see her. 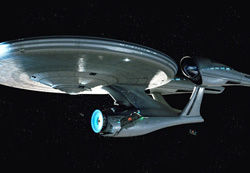 Debuting in 1966, the original Star Trek TV show was created by Gene Roddenberry and follows the futuristic mission of the crew of the USS Enterprise. The starship is commanded by Captain James T. Kirk (William Shatner) and his first mate and science officer, Mr. Spock (Leonard Nimoy). Kirk’s close friend is the cantankerous Chief Medical Officer, Dr. Leonard McCoy (DeForest Kelley). Other valued personnel include Chief Engineer Montgomery Scott (James Doohan), helmsman Hiraku Sulu (George Takei), communications officer Nyota Uhura (Nichelle Nichols), navigator Pavel Chekov (Walter Koenig), head nurse Christine Chapel (Majel Barrett), and yeoman Janice Rand (Grace Lee Whitney). As anyone familiar with modern culture knows, the series was cancelled after three seasons on NBC but found new life in syndication. Eventually, this new popularity spawned an animated series, four more live-action series, ten feature films, and a slew of books, toys, magazines, and other licensed products. Do you wish other original Trek castmembers were in the movie? Yes! I love them all! No. Their time has passed. Actress Majel Barrett has been with the series from the beginning. In the original pilot, she played Captain Pike’s First Officer. The network didn’t like the character’s forthright attitude so she wasn’t used when the second pilot was being made. Barrett’s boyfriend, series creator Roddenberry, gave her a smaller role as Nurse Chapel who has an unrequited crush on Mr. Spock. Barrett also began providing the voice of the Enterprise’s main computer. Barrett and Roddenberry married in 1969, after the cancellation of the Trek series. Chapel appeared in the animated series and only two of the six original cast feature films. For whatever reason, she isn’t remembered as one of the 1960s series’ core characters. In the first live-action spin-off series, Star Trek: The Next Generation, Barrett- Roddenberry was hired to play a new character, the outrageous mother of Counselor Deanna Troi . Though her other on-screen characters have been somewhat forgotten, Barrett has continued to provide the voice of Starfleet computers through the years. In fact, she is the only person to have been part of all of the various Trek incarnations – all five TV series, four feature films, and numerous licensed products. She’s even provided her voical talents to a few unofficial fan productions as well. As the finishing touches are being put on the upcoming feature film, it’s been announced that Barrett- Roddenberry will once again provide the voice of the Enterprise. Other than longtime fans, few moviegoers may notice her participation but it certainly is a nice nod to the actress’ 44 years of Trek history. While we wait for the movie to hit theaters on May 8th, here’s a video tribute to some of Barrett-Roddenberry’s vocal performances through the years. Update: Mrs. Roddenberry passed away in the early hours of December 18, 2008 after a brief battle with Leukemia. She is survived by one son, Eugene “Rod” Roddenberry. She had previously completed on the Trek feature film.